Numaish or “All India Industrial Exhibition” is the biggest fair of Hyderabad held in Nampally during January and February. With around 500 stalls selling all kinds of items, it is thronged by Hyderabadis of all hues. While my wife looks forward to it for interesting bargains on clothes, cutlery, durables and lot of other things, I look forward to the Hyderabadi street food which it offers in the same campus. 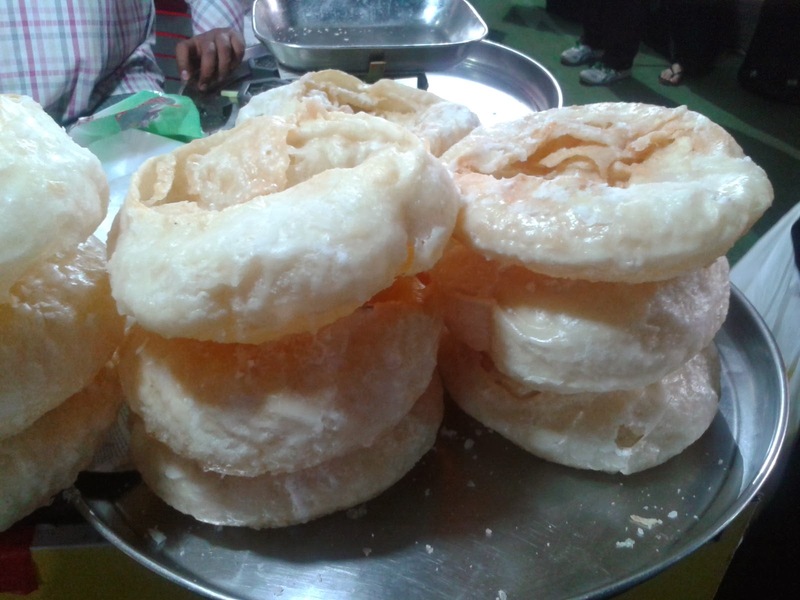 Numaish reminds me of my childhood, and the winter fairs at Calcutta Maidan – stalls, people, dust and food. Like the last 20 years, I just could not wait to sample the offerings this year, and soon found myself queuing up at the large ground on a Friday afternoon. The entrance fee is now Rs 20 per head, and a long queue is omnipresent. The first good reason for any foodie to visit the exhibition is the stall Pista House puts up at Numaish, selling their famous haleem (Rs. 120 per plate) for the entire period. 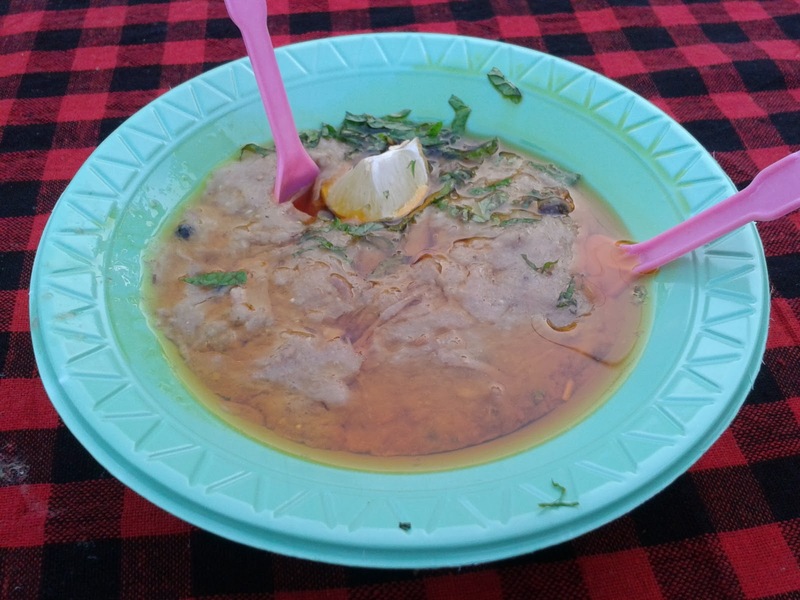 Except a few small joints and star hotels, it is difficult to get haleem in Hyderabad outside of the Ramzan period. 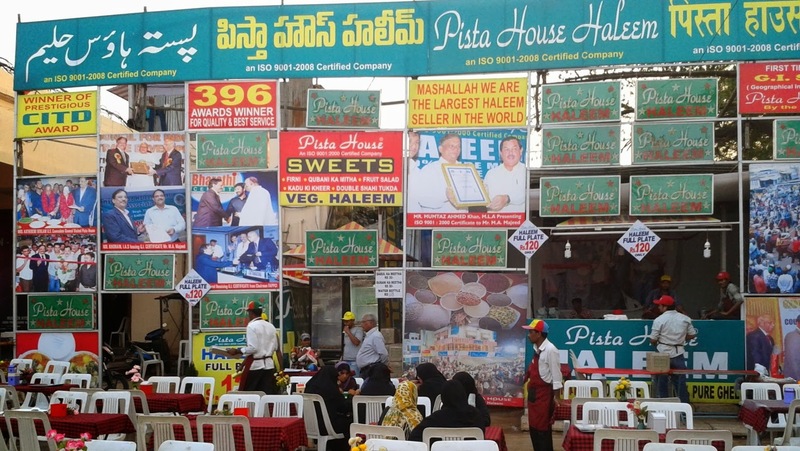 The huge stall from Pista House thus comes as a God sent opportunity in the Hyderabad winter. The stall is a somewhat empty in the late afternoon but picks up crowd at sundown and it is difficult to get a place after 7 pm. Maybe it has something to do with the psyche that Haleem is normally eaten only after the breaking the fast in the evening during Ramzan. Other Hyderabadi delicacies like Double Ka Meetha (a dessert made with bread), and Qubani ka meetha (an apricot based dessert) are also available. 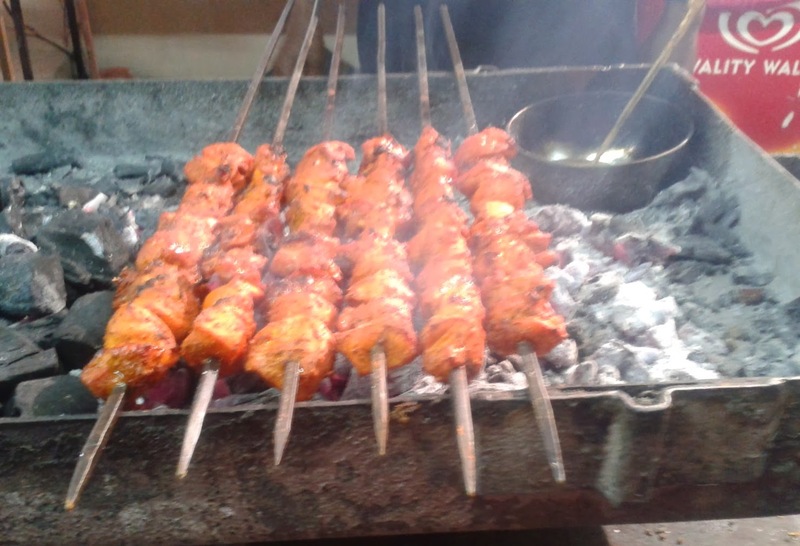 Next to Pista House, is Bade Miyan Kababs (Ismail Restaurant). The restaurant has shifted from its earlier location in the exhibition and is now on an open air rooftop next to Gandhi Auditorium. The place is fairly big too with close to 40 tables. My favorite here is the Patthar Ka Gosht (Rs 170 per plate). Their kitchen is on the outside so you can actually see the gosht(mutton) being slow cooked on the patthar(hot stone). 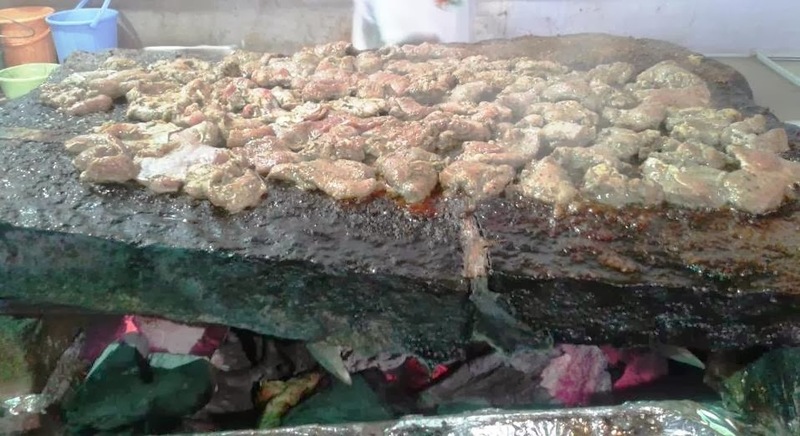 I have a particular liking for the seekh kababs (Rs 150) here which are soft and succulent. 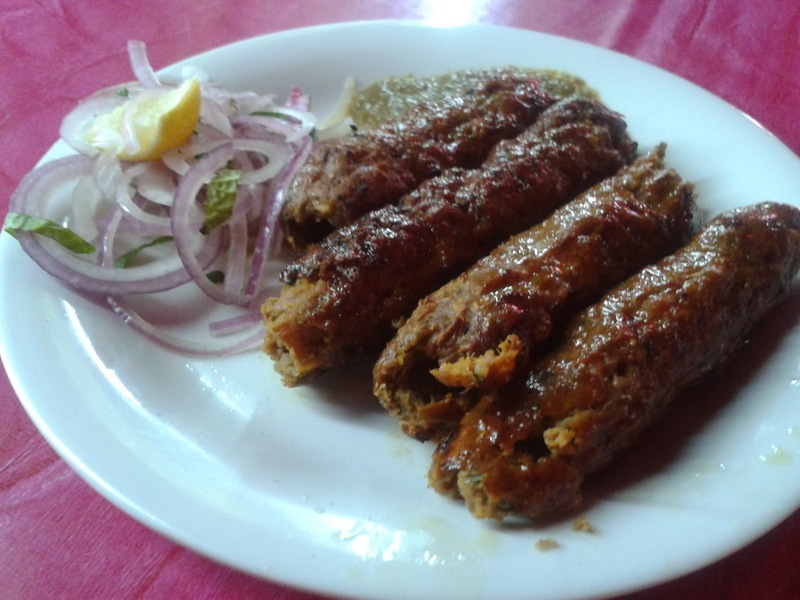 The boti kababs, and chicken tikkas available here are good too when eaten with rumali rotis. 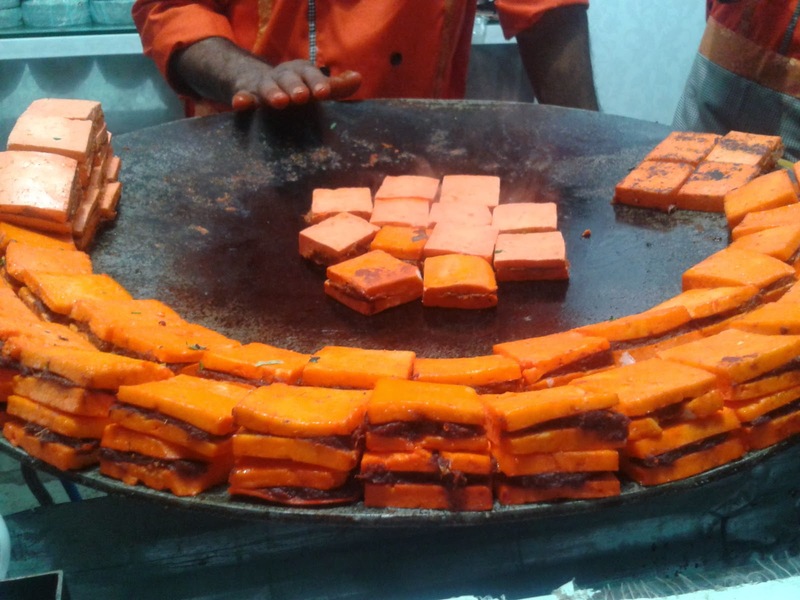 For vegetarians, the most sought after place is the New Agra Diamond Stall, well known for its namkeens and sweets. Huge mirchi bhajis, a specialty of Hyderabad is the first thing which will draw your attention.The Paneer tikka sandwich (spicy pieces of paneer with masala sandwiched in between, served with chat masala and onions) is another favorite. The Aloo Toast and the dhoklas are the other popular dishes which are available here. The sweet section has kesar milk, served in earthen glasses, large gulab jamuns and gajar ki halwa. The regular chaat counters are the other attractions. I visited two of them – Rajasthani Chaat Bhandar near the gate, and the New Gokul Chaat at the place where the Bade Miyan Stall used to be. Both are mammoth stalls with plastic tables and chairs, serving all the chaat items like papri chats, panipuris, sev puris and pav bhajis. 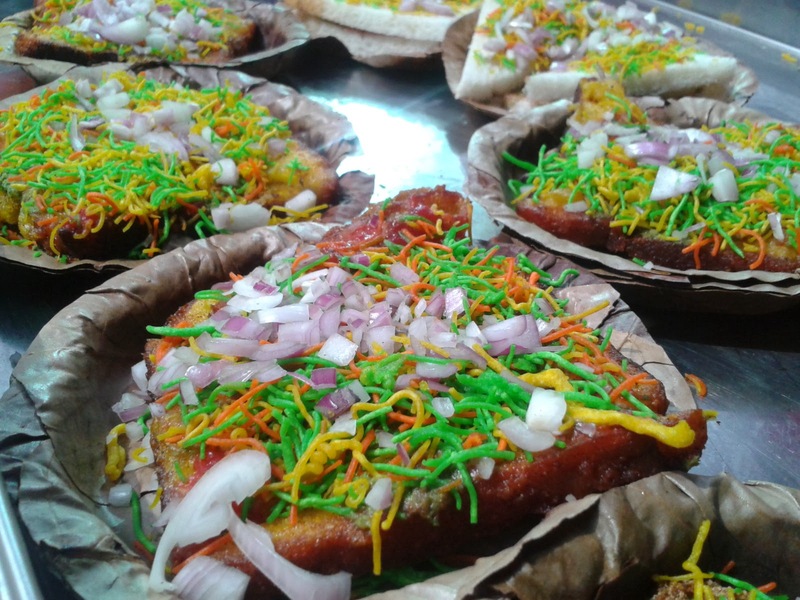 The New Gokul Chat additionally has Khajla, a baqarkhani type of sweet dish, and pethas from Agra. For South Indian snack enthusiasts, Ruchi stall has the normal fare of idlis and dosas as well as delicacies like the Tiranga Dosas and Palak Paneer Dosas. Junnu, a cow milk based pudding which is speciality of Andhra Pradesh is available in the DWCRA stalls. Another thing worth trying is the stall specializing in egg based preparations - Egg Fast Food. The highlight here is Egg Muttabaq (Rs 100) – the egg version of the folded stuffed paratha which originated in the Middle East, and is now extremely popular in Hyderabad. Muttebaq reminds me of the Bengali street food – Moglai Paratha, which is prepared in a similar manner. Egg Lukmi is another innovative dish worth trying out. Apart from these, there are hundreds of juice stalls, ice cream stalls, frankies and normal street food all over the fair. 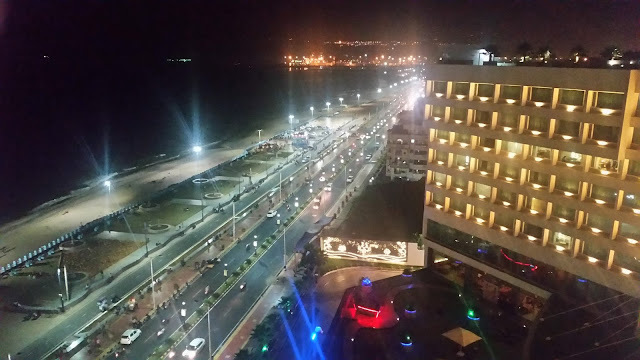 The Numaish is a must visit for any food enthusiast. As the weekends are unbelievably crowded it is better to hit the fair on a weekday evening if possible. Yummy pics. I am due for visit this year. Hope I can make it by next weekend. Really yummy yummy awesome blog and thanks for the information you have provided. It's really amazing and tasty blog about street food.Thanks for sharing with us great blog.